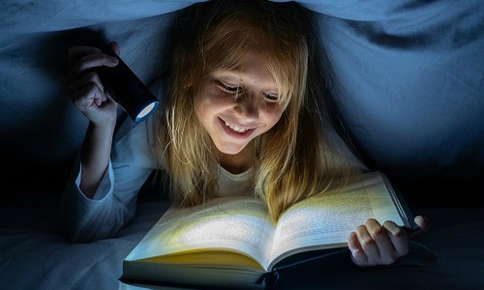 Reading in the dark ruins your eyesight... well, at least according to generation after generation of parents. But is the myth actually true? Tiny muscles control the size of your pupils, the black circles in the center of your irises. When you read a book in dim light, the muscles increase pupil size to allow more light to enter your eye. If you read long enough in low light, the muscles may become a little strained and your eyes may begin to ache. Dryness and headaches can also occur if you don't have enough light when you read. Although reading in dim light may make you uncomfortable, it won't ultimately damage your eyes. In fact, any symptoms you experience are only temporary. Is It Okay to Read Digital Devices in the Dark? Surfing the web on your phone or reading the latest bestseller on your Kindle in the dark can also lead to eyestrain, headaches, and dry eye, although your chances of developing nearsightedness or farsightedness won't increase. Interestingly, it's possible that the habit could lead to temporary blindness if you lie in bed while using your smartphone. Two women in England reported seeing only vague shapes in one eye after using smartphones in the dark. Researchers at Moorfields Eye Hospital discovered that the women used their phones while lying on their sides and kept one eye covered by a pillow. The condition, called "transient smartphone blindness" occurred because one eye became adapted to light, while the other adapted to the dark. When the women later used both of their eyes, they experienced difficulty seeing in the eye they had used to view the screen. Although vision loss caused by the condition only lasts about a half-hour, it can be very frightening. Using your devices in the dark (or in the light) won't make you nearsighted or farsighted, but frequent use may increase your risk of developing age-related macular degeneration (AMD). The condition distorts central vision, making it difficult to read, drive, or recognize faces. Cell phones produce blue light, which may be a factor in AMD, according to a University of Toledo study. The light can trigger a toxic reaction that kills photoreceptor cells in the retina. Photoreceptor cells absorb light and change it into electrical signals that the brain interprets as images. Blue light is also produced by the sun, digital monitors, tablets, video games, digital readers, televisions, and LED and fluorescent lights. While blue light can damage your eyes, it may take years of exposure before you experience a problem with your vision. Don't stare at a book or digital screen for more than 20 minutes at a time. Look at an object in the distance for at least 20 seconds before you begin reading again. Adjust the brightness of your digital screens depending on the surrounding light. Ideally, your screens should be just a little brighter than the light source in the room. Use lamps to provide light where you need it. Although overhead lights are helpful, you may need additional task lighting, particularly as you grow older. With aging comes a reduced ability to see contrasts between black and white. Increased lighting makes reading easier and decreases eyestrain. Add blue-filters to your smartphone and other digital devices and wear eyeglasses that block blue light. Use eye drops if you experience dry eye when reading or using computers or other digital screens. Take advantage of smartphone settings that reduce the brightness of your screen at night. Wear sunglasses year-round to decrease the effects of blue light on your eyes. Enhancing your vision can be as simple as following these tips and scheduling regular eye exams. If you're concerned about a vision issue, or it's been a while since your last exam, contact us to schedule an appointment.